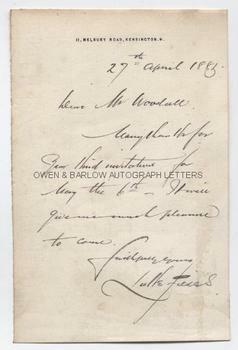 LUKE FILDES Autograph letter Signed. Sir Samuel Luke Fildes (known as Luke Fildes). British (English) painter. ALS. 1p. 11 Melbury Road, Kensington, W. 27th April 1885. To [William] Woodall. Together with a contemporary portrait photograph. "Many thanks for the kind invitation for May 6th. It will give me much pleasure to come." 12mo. Approx 5.5 x 3.5 inches. 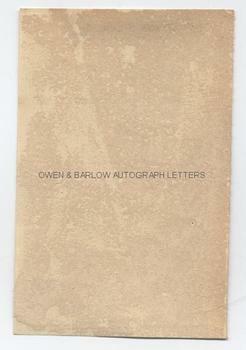 Lacking integral blank leaf and with mounting residue to verso, else near fine. 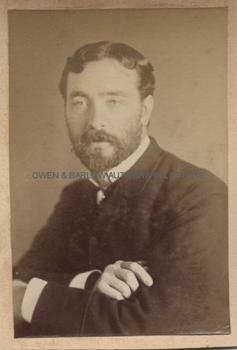 The portrait of Luke Fildes is an albumen photograph of carte de visite size, measuring approx 3.5 x 2.5 inches. It shows him quarter-length with arms folded. 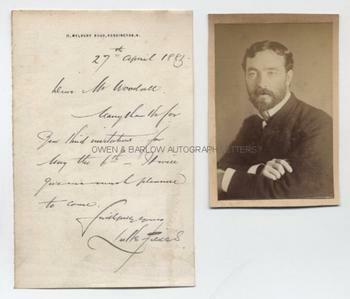 The photograph is mounted on card from an album leaf, with slight mounting trace to verso but the photograph is in fine condition. Luke Fildes was a member of the group of painters that included Hubert von Herkomer and Frank Holl, working in the 'social realist' style and influenced by Frederick Walker. He was a campaigner for the relief of poverty and much of his early work highlighted the plight of the poor in England. His work for the Graphic did, like the writing of Charles Dickens, help to bring conditions in the city slums to the attention of a wider public and did much to influence public concern. John Millais drew the attention of Charles Dickens to one of Fildes' drawings and Dickens was so impressed that he immediately commissioned Fildes to provide the illustrations for 'The Mystery of Edwin Drood', Dickens' last novel. Luke Fildes also illustrated other novels, including those of Thackeray, and provided numerous caricatures for the magazine Vanity Fair under the nom-de-crayon 'Elf'. Fildes soon moved on from illustration to become one of the most accomplished painters of his generation. His major works include 'The Village Wedding' and 'The Doctor'. With Henry Woods he became leader of the group of painters known as the 'neo-Venetian' school and in 1874 he married Henry Woods' sister. He was a friend and associate of Marcus Stone and the two were close neighbours in Melbury Road. The invitation that Luke Fildes is here accepting is from the radical M.P. William Woodall and is probably a dinner invitation, either to the House of Commons or the Savage Club. Other documents from the same source reveal that other attendees that night were the artists Fred Barnard, Edwin Buckman and John Dinsdale. JOHN TENNIEL, on the other hand, initially accepted but was prevented from attending by illness.